The last blog article was about installing PS3 Media Server on Windows 7. So let’s start PS3 Media Server by double clicking the desktop icon. The Windows desktop firewall is enabled by default. You have to give permission for communication between “javaw.exe” and your home network. PS3 Media Server tries to detect so called media renderers (DLNA/UPNP playback devices) like Playstation 3. PMS supports a range of devices. It is possible that your playback device/software is not detected correctly. Then an “unknown renderer” will be detected. It is strongly recommended that you limit access to files and folders. In “navigation / share settings” press the green plus button in “shared folders” section. Add all folders with media content to be shared with your home network. After adding the folders press the save button on top. Switch to “common transcode settings”. You may have a look at “general settings”. Check if the number of cpu cores were detected correctly and change it if necessary. Have a look at section “audio settings”. If your playbackback device is capable of playing surround sound select “6 channels (5.1)”, otherwise choose “2 channels (stereo)”. Select “keep AC3” if your playbackback device is capable of playing Dolby Digital surround sound (AC3). 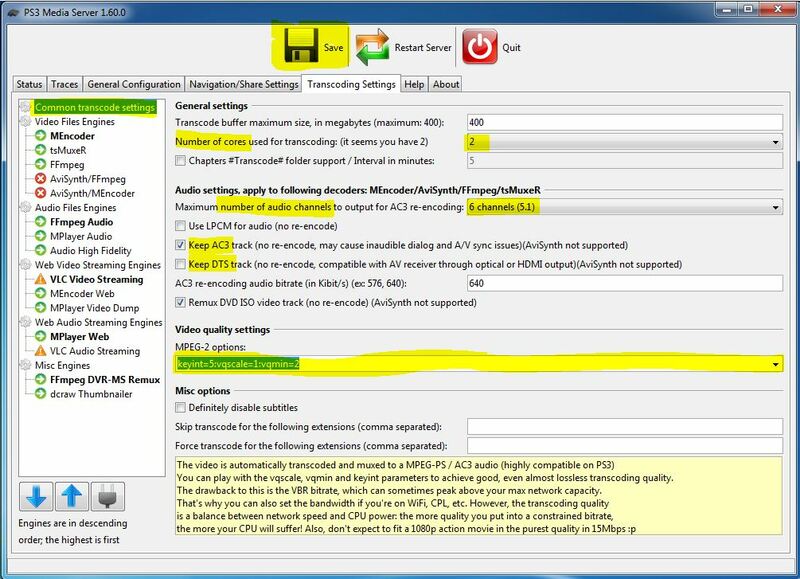 Select “keep DTS” if your playbackback device is capable of playing Sony Digital surround sound (DTS). Some playback devices like Playstation 3 may not support streaming DTS/AC3. For these devices additionally select “use LPCM”. In section “video quality settings” you only have to change settings if you have poor network bandwith. 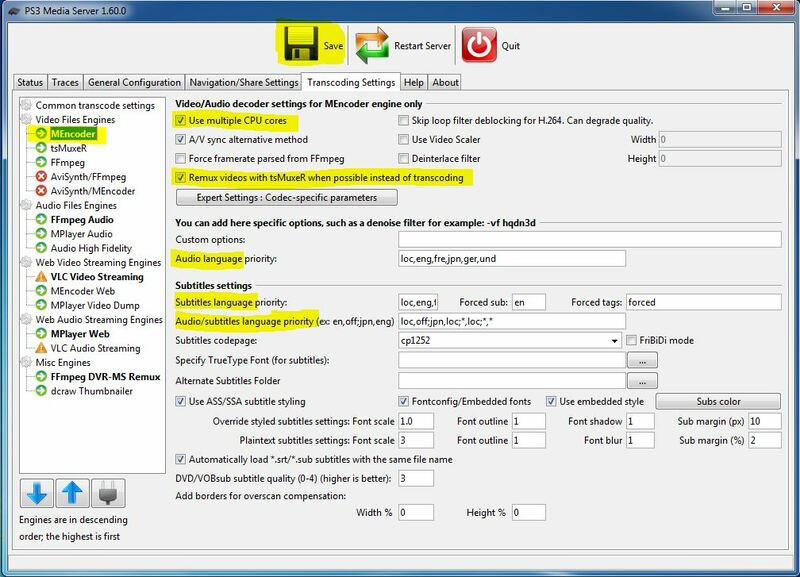 This setting is only valid for usage of transcoding engine “mencoder”. Don’t forget saving your settings! “use multiple CPU cores” should be enabled for performance reasons. “remux videos with tsmuxer” should be enabled. 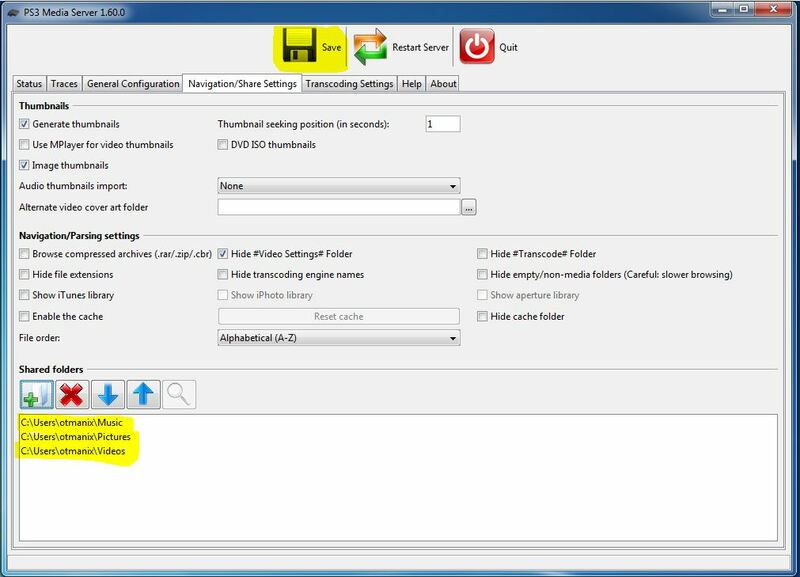 If you want to play a video file that contains an audio codec which is not comaptible with your playback device PMS will convert the audio stream to a compatible format on the fly. This feature is also used when the video container format is not supported (like mkv on Playstation 3). If you encounter problems with this so called transcoding engine “tsmuxer” you can enforce the usage of transcoding engine “mencoder” by using virtual folder #transcoded#. PMS will then convert the video-stream to MPG2. This is not recommended because it costs much CPU ressources and network bandwith. Please note that playback of subtitles automatically enforces usage of mencoder engine! A video file may contain several audio and subtitle languages. You can change behaviour of automatically choosing languages. Fine. All basic settings are done. Quit PS3 Media Server by clicking the “Quit” button. This entry was posted in Multimedia and tagged Audio, DLNA, Photo, Playstation 3, PS3, PS3 Media Server, UPNP, Video. Bookmark the permalink. Probably you forgot to install Java Runtime Environment. Startup of PS3 Media SErver is not depending on any Windows service. If you want to get detailed infos about startup you can have a look at the debug.log. You can also start PMS via commandline (open command prompt, change to PMS install directory, start pms.bat). Hi there. I have a problem whit ps3 Media Server. Im Portuguese so the subtitles are in Portugueses. When im going to see a movie dont show in Portuguese the subtitles are in ingles. Does the program Converte to ingles? Change “subtitles language priority” in settings, save and restart PMS. You can also select the preferred subtitle for each movie manually by entering virtual folder #transcoded#. I am not having any luck. I have tried a couple versions, and I think I finally have the right one… I’m running Windows 7 64-bit, I downloaded both the 32-bit and 64-bit Java Runtime Invironment. This shows up on the PS3 and I’m able to search files that are on my computer from the PS3, but the program doesn’t work on the computer…strange or ??? There may be several reasons why your renderer device wasn’t discovered. Main reasons are network and security settings (firewall, upnp and other security settings on your pc/mac/router). Perhaps your renderer is able to browse another UPNP software running on your pc like Windows Media Player?